Winter Photo Frames is the best "photo editor" for your mobile phone on the market! Edit your photographs completely free of charge and have tons of fun! Download Winter Photo Frames now and decorate your photos with more than 50 different photo frames, stickers, collage templates and photo effects. If you love having fun editing your selfies by adding different kinds of winter decorations, then this is a perfect application for you. Wrap your pictures with shiny white snow, funny Snowman stickers or beautiful crystal snowflakes like a professional with this new “image editing application” and make wonderful "Winter wallpapers" for your new mobile phone or tablet. What are you waiting for? Try it now! ✪ Try a brand new photo editor for FREE! 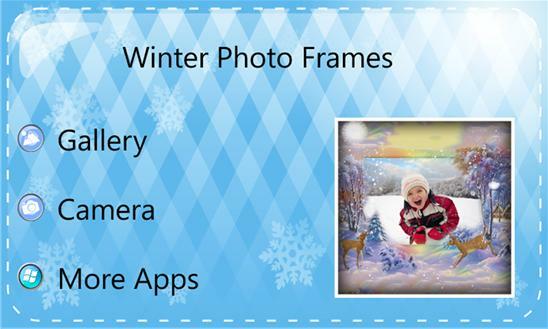 ✪ Take a selfie with your camera and apply winter photo frames to it! ✪ Rotate, scale, zoom in, zoom out or drag images with the best selfie foto editing app! ✪ Choose from various picture frames for baby pictures, love photo frames birthday frames, kids frames, cartoon frames for kids and many more! ✪ One of the best free apps on the market allows you to save your beautiful selfie pictures and beautify them with natural picture frames or wedding photo frames of your choice. ✪ You can also select a funky pic from your cool photo gallery, share it instantly, or set it as a wallpaper background! ✪ Social share button – share your pics with your best friends instantly via Facebook, Twitter or Instagram. ✪ Get this unique image editor and and use this photo editor software to create beautiful images! ✪ “Winter Frames” fully supports horizontal orientation and looks amazing on tablet devices as well as on mobile phones. Are you ready for the beautiful winter?! Is winter your favorite season of the year? Do you enjoy when everything turns white and elegant with beautiful winter snow and frost? What about playing with your photos adding different colors, stickers and frames? If the answer is yes, then "Winter Photo Frames" are ideal for you! Download the wonderful Winter Photo frames app for free and start making your own pics art embellished with dazzling nature in winter time on your mobile phone. It is easy to use and offers a variety of colorful backgrounds, text, templates, photo frames and stickers. If you still need more, you can also choose from many of the photo filters and effects included in this amazing “free photo editing” app. Just try this cool pic stitch software for yourWindows phone mobile phone and soon you’ll see all the wonderful things you can do with it! Get it now and prepare yourself for the photofunia! This fun application includes pictures of beautiful winter landscapes, frosty windows with thousands of snowflakes, funny Snowman in your front yard and other winter wonders. You will also find photo frames with breathtaking nature covered with beautiful white winter snow that will always get you in the mood to go out and have fun. 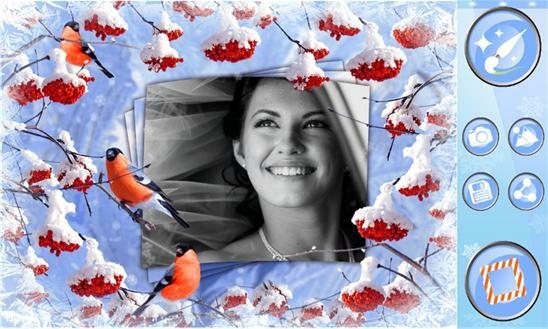 Try it now and you will see that Winter Photo Frames is your next favorite “photo frames application"! Keep your loved ones all at one place with you every day. Get this cool “photo editing software” and create wonderful memories. After you are done making wonderful pics art of your friends and family, you can store them in your phone photo gallery or share them on Facebook, Twitter or Instagram. Everyone will LOVE it for sure! With these “free photo frames” you can instantly create HQ wallpapers for instant photo fun! Get now FREE pic frames app and let the photofunia begin! Start your own art gallery!! *This app is ad – supported.